“Jesus said, ‘Do not hold on to me, for I have not yet returned to the Father. Go instead to my brothers andtell them, “I am returning to my Father and your Father, to my God and your God.’” (John 20:17 NIV emphasis added). Earlier Jesus taught, “I am the good shepherd; I know my sheep and my sheep know me…My sheep listen to my voice; I know them, and they follow me” (John 10:14,27). When the shepherd spoke her name, this precious lamb recognized him right away. And what was the first word the risen Savior spoke? “Woman.” Don’t you love it! Jesus came to set women free from societal and religious oppression of his day. He honored women. He respected women. He appointed women. His first spoken words after his resurrection were directed to one of us – and in a sense, it was meant for all of us. Jesus said, “Do not hold on to me, for I have not yet returned to the Father. Go instead to my brothers andtell them, “I am returning to my Father and your Father, to my God and your God” (John 20:17). How does understanding how women were treated in those days shed light on just how important God’s female image-bearers were to Jesus and how He went out of His way to honor them? Let’s compare notes at www.facebook.com/sharonjaynes. Click over and share your thoughts. 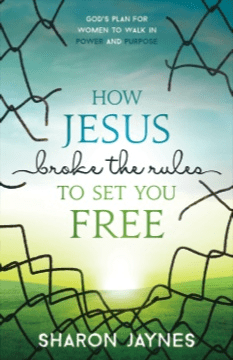 Today’s devotion was taken from my book How Jesus Broke the Rules to Set You Free: A Woman’s Walk in Power and Purpose. Ever wondered just how valuable you, as a woman, are to God? Let’s find out! We tend to read the gospels with our 21st century eyes. But when we understand how oppressive the culture Jesus stepped into was toward women, we begin to understand just how radical Jesus’ ministry, messages, and miracles were at setting women free...at setting you free. He risked His reputation to save theirs…and yours. You’ll write your name into the gospel and see yourself in the lives of the women of the New Testament to fall in love with Jesus all over again! You’ll begin to walk in the power and purpose that God intended all along. Buy this book from any retailer in the month of October, send a copy your receipt to kim@sharonjaynes.com, and receive a free download of the 118-page Expanded Bible Study Guide.